We kicked off at 6.15pm with 16 players, and because it was such an early start I decided to go for 7 point matches. 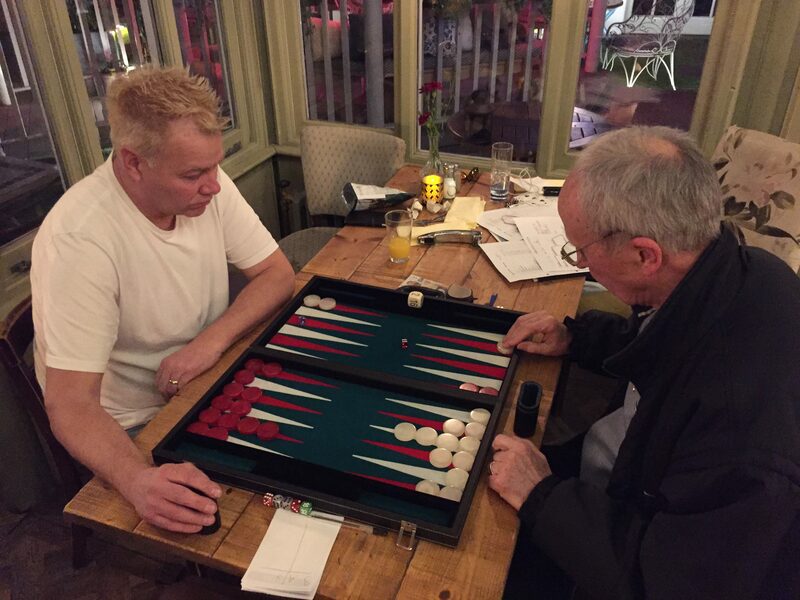 After ensuring that all first round matches were in progress, I sat down for a quiet dinner….or so I thought! Catalin (Cat) Bucur was 4-0 up in his match against Sion Edwards when he received a telephone call. After apologising to his opponent for the interruption, he went outside the pub where he had to meet someone. Ten minutes later he had still not returned, but a passer-by came into the pub asking for me, to let me know that Cat had been involved in an accident on the road outside. I immediately went out to investigate and found Cat lying in the road surrounded by several people, following an incident involving a car which had sped off. Cat had been unconscious briefly but was now awake. Two police officers soon arrived at the scene and Cat was made to stay still, pending the arrival of an ambulance. As well as hitting his head on the tarmac, Cat’s hand was bleeding and he had a nasty ‘road rash’ on his side (see picture). Soon after the paramedics arrived, Cat was sitting up and was then taken inside the ambulance for checks. 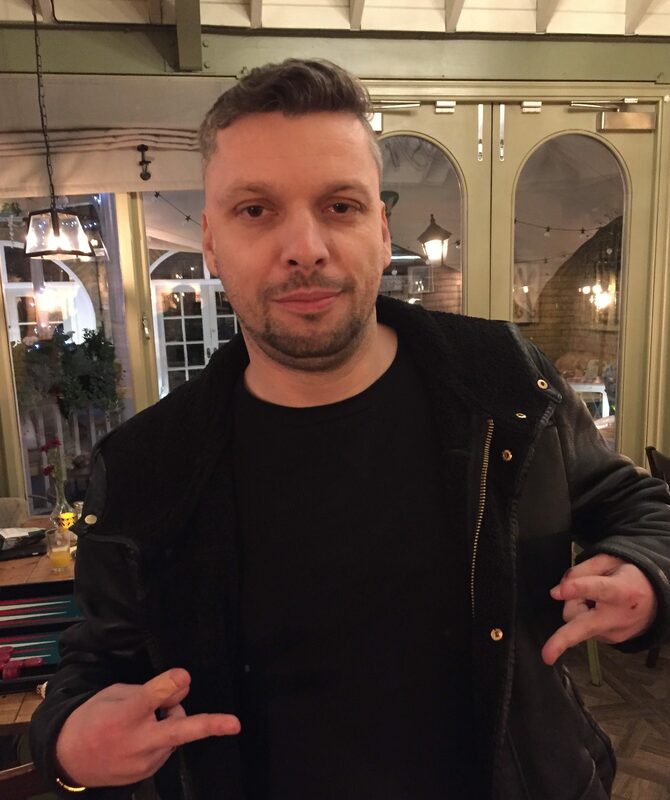 We all assumed that he would be taken to hospital as a precaution, and I even told Sion that he was through to the next round of the tournament by default. However, fifteen minutes later Cat returned to resume his match. Sion sportingly agreed to continue, and Cat quickly won. After that, Cat acted like a man on a mission and also made short work of Steve Carder, helped by my prediction that Steve (Black) would roll a horror 63 to reach the position shown below. Tariq was similarly despatched in relentless fashion, so Cat was ‘catapulted’ into the final against an on-form Anna Price. Spectators gather round to watch the climax…. As closing time for the Grange was now about an hour away, the final was shortened to 5 points, and Cat pulled ahead to reach 4-2 Crawford. A win in the next game for Anna made it DMP, and a very strange position arose with Cat playing a 3-4-5 backgame, while Anna brought all 15 of her checkers to her 6-point! Cat couldn’t keep all three back points because he needed more men up front, plus he needed to give Anna some bad numbers…but for a while Anna didn’t co-operate. Finally, after a succession of 64s, 52s, and a few 1s (while carefully avoiding blotting threes!) Anna finally left a last-ditch double shot after bearing off seven men. Cat hit and completed the closeout, but Anna re-entered at the first opportunity when Cat cleared his 4-point. Soon afterwards, two double 2s made Anna big favourite again, and with just two men on her 2-point and one on her ace any of the five largest doubles would have sealed the win immediately. She rolled the wrong double – aces – allowing Cat one more roll. He also had three men left (two on the ace and one on the two) and so required any double. 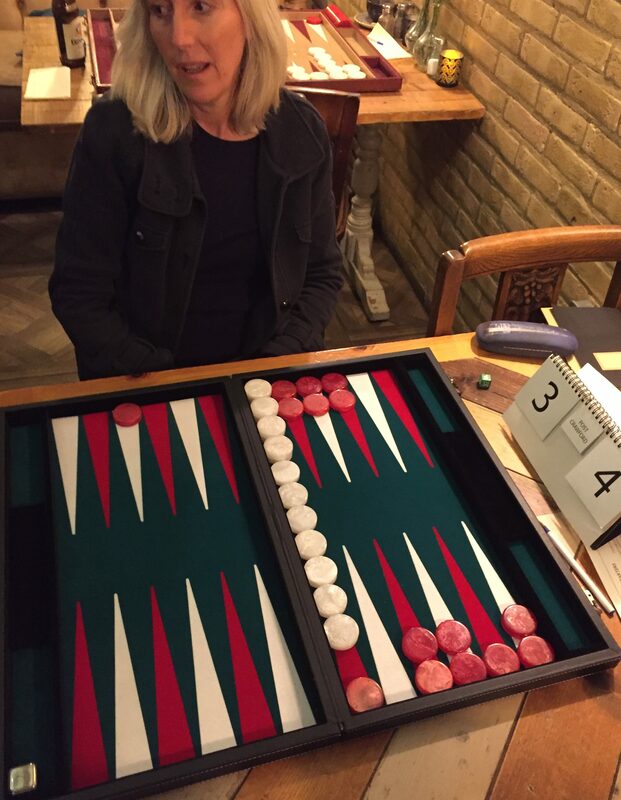 Cat made no mistake….it was his turn to roll double 2s and out they popped to win the match and the tournament! The Victor….thanks to his final roll of double twos! 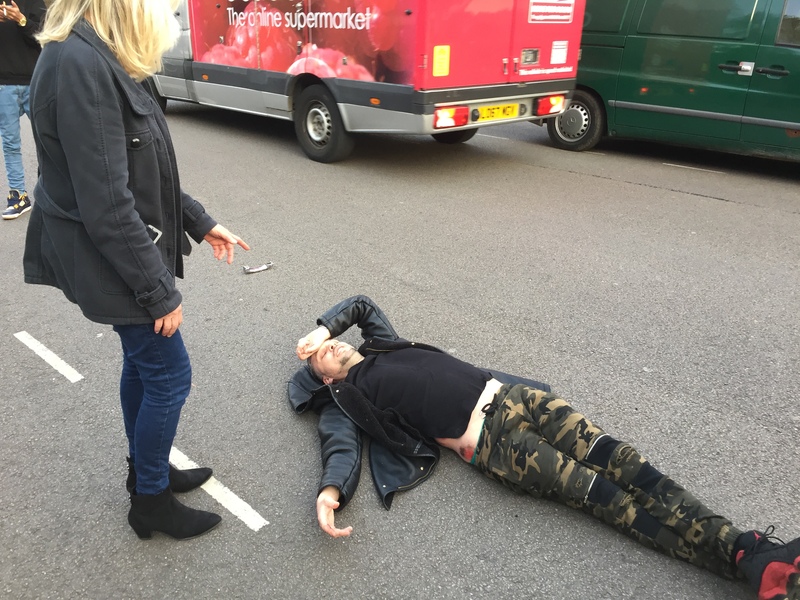 Coming back from a big match score deficit is not uncommon…to come back and win four straight matches immediately after lying injured and unconscious in the road is quite an achievement! 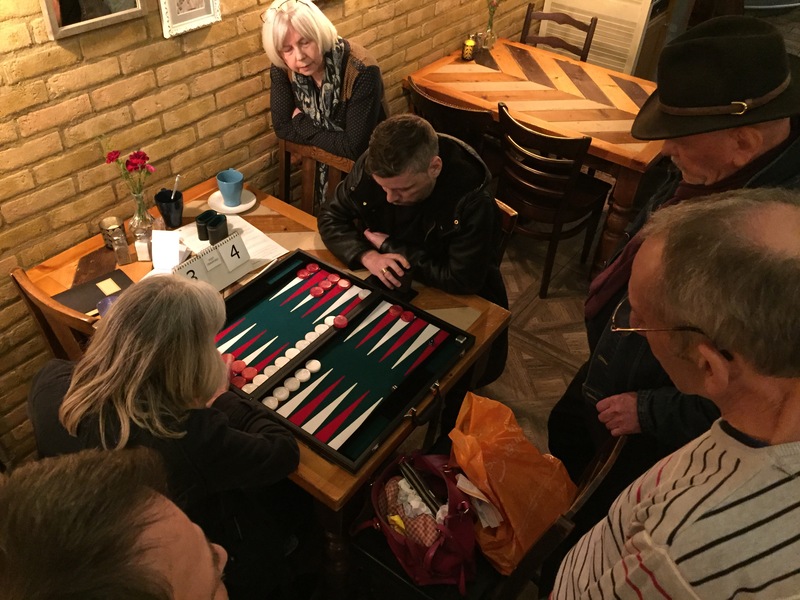 Just to complete this report, we played three more ‘Consolation’ knockout tournaments last night, with Monica and Alan Beckerson winning one apiece, and Bill Pope winning the last. Congratulations to all the winners, but especially to Cat. Finally, just in case you were wondering, everything described above really did happen, and on April 1st. I couldn’t have made it up! I wasn’t at all surprised ! When Cat’s around there’s always plenty of action ! I knew getting run down wasn’t going to stop him coming back in and destroying whoever he met in each round ! He’s a great, exciting player with a whole lot of attitude ! Top Man ! I’m with Tim in finding the whole story hard to believe, especially because of the date, though I doubt you’d fake the accident part just for a joke. But that final position is even weirder than a lot of what really happens in BG, which is plenty weird enough! Wow Mary, I think a few of us could use a tutorial from you in how to use xg, I certainly don’t know how to add a move xg doesn’t list to its already suggested top moves. Re the 44 play, my thought process would be to leave the 20 and 21 point each with one checker to give Anna bad 1’s and 2’s but not cover the two point just yet. So my play would be 21/17, 20/12 and 15/11. Not sure I trust xg on these deep backgames , I would be taking mainly because I couldn’t give an interesting game like this one up at this point. Your good play is one of two that are tied for first place after a 2-ply rollout, and also after a 3-ply rollout I didn’t let finish. The other winner was 21/17 21/16 15/11 6/2, which I don’t believe for one minute is correct because of the “6/2” part. The 6 point is better for later containment and root number producing, so why take a checker off it when you can put a second checker on it, with 22/6? That was the play I added, which was best on 4-ply but didn’t survive the rollout. To add a play, right-click the list of plays, and second from the bottom you will see “add a move”. Click that, then type the play you want to add in the same form XG uses, and it will add it for you. I don’t know everything XG does, either! I’m always learning about features new to me. Whatever did we do without it? Thanks Mary for the xg tip, its a great programme, hoping a new version is brought out soon that plays very deep positions better which I think will also help its evaluations earlier in games. 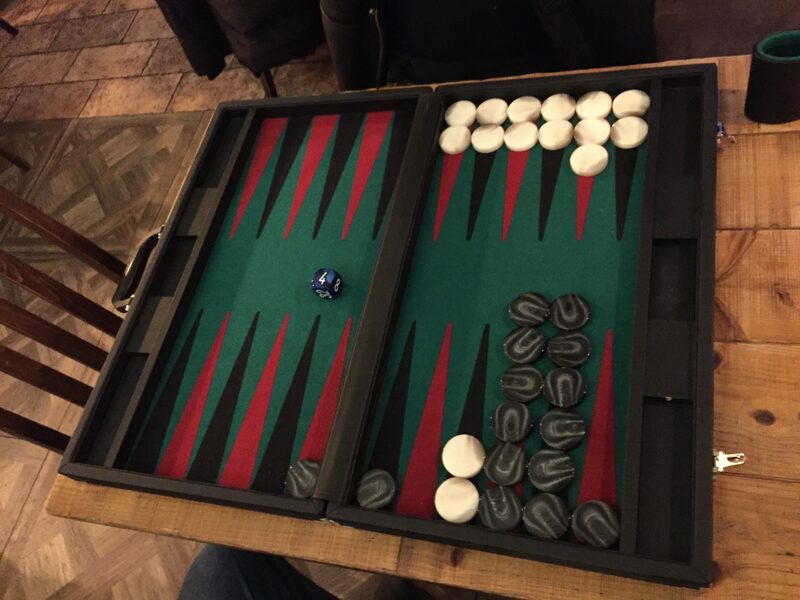 I didn’t even see your play (22/6), one of my main faults in backgammon. 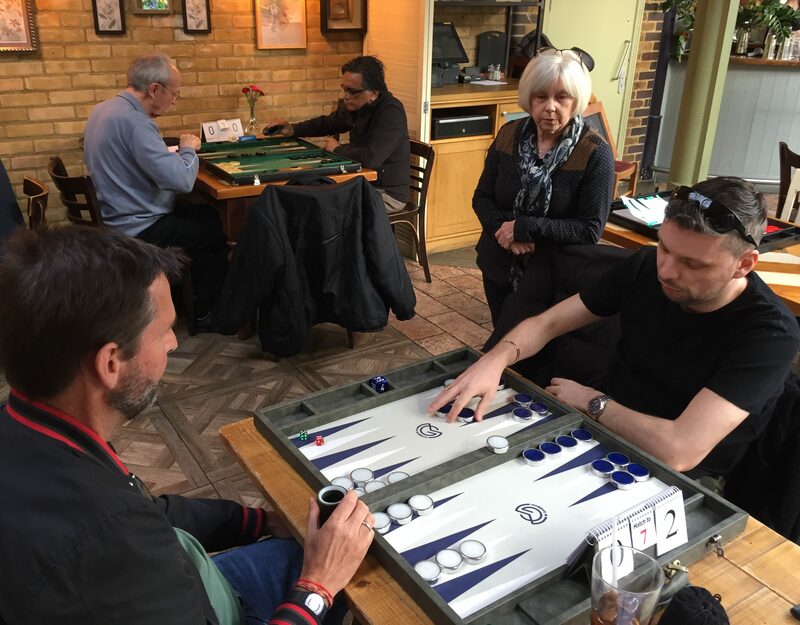 I forsee Backgammon: The Movie coming soon. Still not convinced despite Peters last sentence. Great story whether true or an April fool. Given the date it happened, I can understand it might be hard to believe. But there were too many witnesses for them all to be in on a conspiracy. 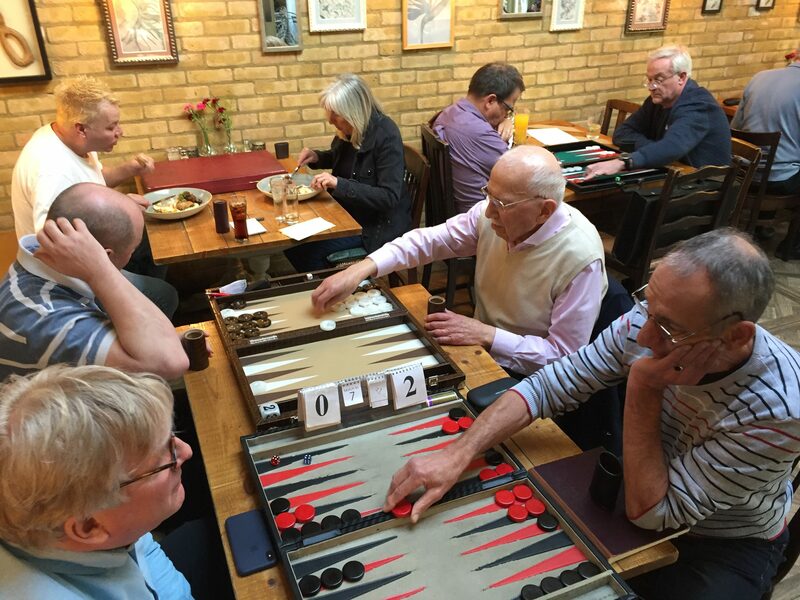 Ask Anna Price, Sebastian Adams, Sean Clennell, Steve Carder, Simon Morecroft, Bob Young, the Beckersons….or any of the twenty players at The Grange last night!! Well Anna, that’s good enough for me. Wow, What a day !? What an exciting turn of events. This would make a great short film!